These blue-eyed cuties, wild cub and domestic kitten posed cheek to cheek, eye one another lovingly and playfully, but with just a hint of suspicion. For all too soon this magic moment will pass, as the former grows up into a formidable predator, and the latter must stay far away from him or become potential prey. Ah, the innocence of youth in the animal kingdom! 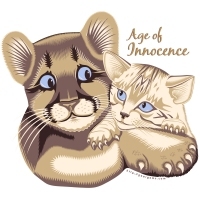 Any feline lover can now proudly wear this adorable Age of Innocence digitally-drawn artistic graphic representation, exclusively available from GearGems, on a t-shirt or other apparel, or display it on any of the high-quality giftware items available for print on demand. Get it now as a gift for that special ailurophile you know!